Redefine commercial signage, storefronts and awnings using the 12" Warehouse Shade Gooseneck Lights. This chic contemporary light fixture has a solid aluminum construction with a rust resistant powder coated finish. Inspired by American industrial lighting styles, the Warehouse Shade embodies a utilitarian nature ideal for outdoor use. Mount Warehouse Lights above large signs, or use to highlight building exteriors and entryways. A choice of 25 powder coated finish colors allows for easy matching to any design aesthetic. Gooseneck lighting online at Sign Bracket Store comes with standard incandescent lamping unless noted otherwise. Optional upgrades to compact fluorescent, energy efficient LED, or high-intensity discharge lamping are also available; please note ballast requirements may change for HID gooseneck lights. Standard gooseneck arm and Warehouse Shade combinations come with an aluminum back plate for wall mount. Install with any standard 4" junction box. All pieces are powder coated to match except for the inside of Warehouse Shades that are left white for maximum brilliance. 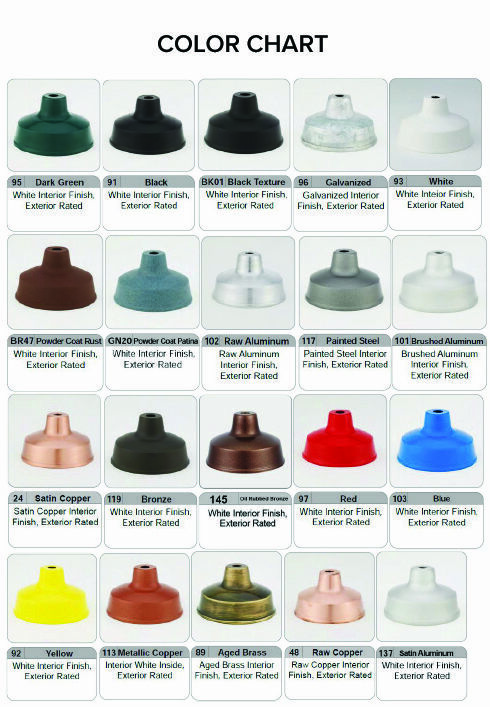 Gooseneck fixtures are UL Listed. Please call toll free for custom requests and accessories not available online.